Jacques Lefranc was dismissed by the owner of France Soir, as his paper became embroiled in a developing row between Muslims and the European press. Some Muslim countries have withdrawn their ambassadors to Denmark and boycotted Danish products after a paper there first printed the cartoons. Norway has closed its West Bank mission to the public in response to threats. Foreign Ministry spokesman Rune Bjaastad told the BBC news website the office would remain closed until further notice but no decision had yet been made on whether to withdraw staff. 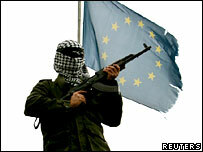 Two militant groups earlier threatened to target Danes, French and Norwegians in the Palestinian territories. 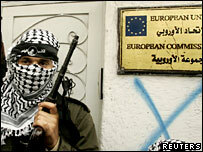 Palestinian gunmen briefly surrounded the offices of the European Union in Gaza on Thursday and demanded an apology over the cartoons. The row intensified when France Soir, alongside the 12 original cartoons, printed a newly created cartoon on its front page showing Buddhist, Jewish, Muslim and Christian holy figures sitting on a cloud, with the caption "Don't worry Muhammad, we've all been caricatured here". Publications in Germany, Italy, the Netherlands and Spain also re-ran the Danish cartoons on Wednesday to show support for free speech. However France Soir owner Raymond Lakah, a French Egyptian, said in a statement to AFP news agency that he "decided to remove Jacques Lefranc as managing director of the publication as a powerful sign of respect for the intimate beliefs and convictions of every individual". "We express our regrets to the Muslim community and all people who were shocked by the publication." Journalists at the newspaper stood by their editor's decision on Thursday, printing a front page picture and editorial in which they strongly defended the right to free speech. Religious freedom gives people the right to practise their faith or not, the editorial says, but should not become a means to impose the rules of a single religion on society as a whole. French MP Herve Mariton condemned the sacking as "in total contradiction of the tradition of press freedom". Speaking to the BBC, he said Mr Lefranc had, by printing the cartoons, at least given people the chance to see what the debate was about. Islamic tradition bans depictions of the Prophet or Allah. The caricatures from Denmark's Jyllands-Posten included drawings of Muhammad wearing a headdress shaped like a bomb, while another shows him saying that paradise was running short of virgins for suicide bombers. Syria and Saudi Arabia have recalled their ambassadors to Denmark, and Libya has closed its embassy in Copenhagen, while the Danish-Swedish dairy giant Arla Foods says its sales in the Middle East have plummeted to zero because of a boycott of Danish products. There have also been demonstrations and death threats in some Muslim nations. The offices of Jyllands-Posten had to be evacuated on Tuesday because of a bomb threat. The paper had apologised a day earlier for causing offence to Muslims, although it maintained it was legal under Danish law to print them. Danish Prime Minister Anders Fogh Rasmussen welcomed the paper's apology, but has rejected calls to punish the paper, saying the government cannot censor the press. Reporters Without Borders said the reaction in the Muslim world "betrays a lack of understanding" of press freedom as "an essential accomplishment of democracy."